With a big holiday weekend right around the corner, we teamed up with southern lifestyle expert Lauren Cermak to show you how to make the most of your outdoor party. Read along as she shows you what to wear, where to decorate, and how to make the perfect menu! Memorial Day is truly such a special day. I don't know about you, but I often lose sight of how lucky we are to live with the freedoms that we are blessed to have. It is so important to take the time to remember, honor, and celebrate those who have fought to protect these freedoms. 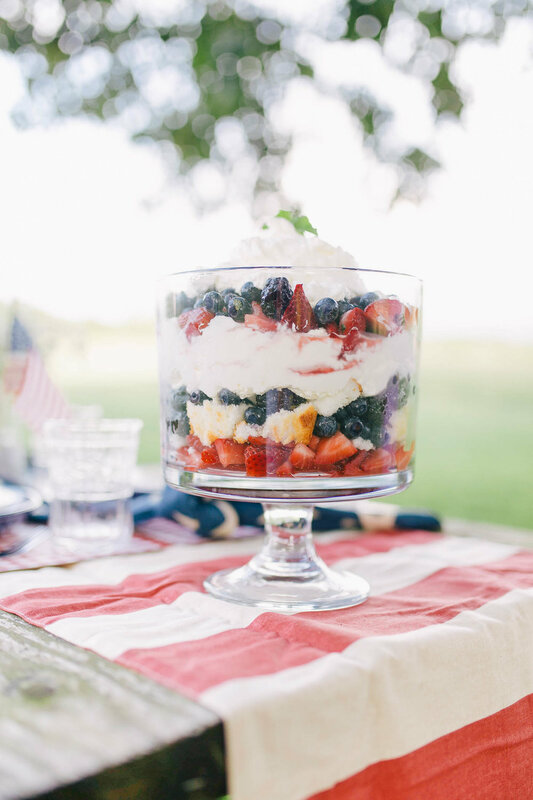 This is why I was so excited to work with Maggy London to share some Memorial Day celebration inspiration! A Quick Story: Maggy London has long been a brand that filled my closet. My very first Maggy London dress was a classic LBD (little black dress) that I bought because I knew that it would stand the test of time in both style and quality. That is what I love the most about the Maggy London brand...their silhouettes are timeless! For this shoot, I chose two different looks to share with you all — each very picnic appropriate! I loved how the ease and free-flowing shape of the Mariana Maxi allowed me to move and play as I much as I wanted! This pretty cotton dress is the perfect choice for summer barbecues, beach nights, or outdoor parties. And can we talk about the details?! The ruffled hem, tiered waist, and poms make this dress a summer go-to! This perfectly printed Renata Shift made me feel all kinds of sass! The lightweight fabric of this dress makes it the perfect pick for those hot summer days. I especially love how the haltered neckline of this dress leads to thick straps with a more open back! I can't wait to pull this one out for every outdoor occasion in the books this summer! For the table setting, I went with a very classic American theme. It is Memorial Day after all! I wanted to really showcase the beauty of our flag and the colors that it consists of. When playing with an American flag theme, it can all tend to run together if not done properly. I chose to mix up the patterns of each piece in order to keep the eye dancing! I especially loved how the gingham placemat played with the simple navy star napkins. To tie the table together, I chose a 7-glass, hinged metal bud vase. I loved the way that the delicate white baby's breath brought a touch of femininity to the table! The menu consisted of chicken kebobs, Greek pasta salad, watermelon salad with mint and lime, jalapeño cheddar corn muffins, and a holiday-appropriate mint berry trifle! Between the heat and the activities that come with summer, I have found that it is good to keep the menu on the lighter, more refreshing side! Psst! Keep scrolling to the end of the post to see how I made this trifle! Preheat oven to 350 degrees. Add sugar to a food processor for two minutes to create a very fine sugar. In a medium bowl, mix cake flour, salt, and half of the sugar. In another bowl, whisk together egg whites water, vanilla, and cream tartar for about 2 minutes. Pour the egg white mixture into the bowl of a stand mixer fitted with the whisk attachment. Slowly add the remaining sugar and beat until medium peaks form. Gently sprinkle some of the flour mixture on top of the egg white mix and gently stir in. Repeating until all of the flour has been added. Spoon the mixture into the ungreased tube pan and bake for about 30-35 minutes or until golden brown and a toothpick comes out clean. Invert cake pan and allow to cool completely in upside down pan. Once cool cut into 1-inch cubes. In a small bowl combine the strawberries with 1/4 cup of sugar, 1 teaspoon vanilla, and 1 tablespoon of chopped mint. Stir and let sit for at least 20 minutes. In another small bowl combine the blueberries and blackberries, add the remaining 1/4 cup sugar, 1 teaspoon vanilla, and 1 tablespoon of chopped mint. Stir and let sit for at least 20 minutes. In a bowl or a stand mixer fitted with whisk attachment, whisk together heavy cream and confectioners sugar on medium/high speed for about 2-3 minutes or until the cream has thickened.